Remember watching the remake of Clash of the Titans? Remember being disappointed by the things they changed from the classic? Remember Sam Worthington’s horrible acting in it? Remember hating the horrific 3D effects? Well, I do. And it was those reasons, and more, that made me want to avoid this sequel. "Kneel before Zo-..I mean, before ME, Daddy Zeus!" Some of the stuff in this film is what you would expect…Liam Neeson is the same character-type as Zeus as he normally is. Ralph Fiennes is one of the most interesting characters as the Voldermort-ish Hades. Sam Worthington is still in bad need of a comb. The CGI works pretty well, etc, etc. But what I found to be rather disappointing in this sequel is that, while the action and adventure may keep your attention…the story does not. See, with the remake of Clash of the Titans, they didn’t have to reinvent the tale to make it exciting…the story already existed (and yet they still failed to make it a great movie). With this one, their challenge was to create a film with a great story as well. Don’t get me wrong, it’s not a bad story, but I felt very little for the characters…including the soft attempt at trying to make me feel bad for Hades. 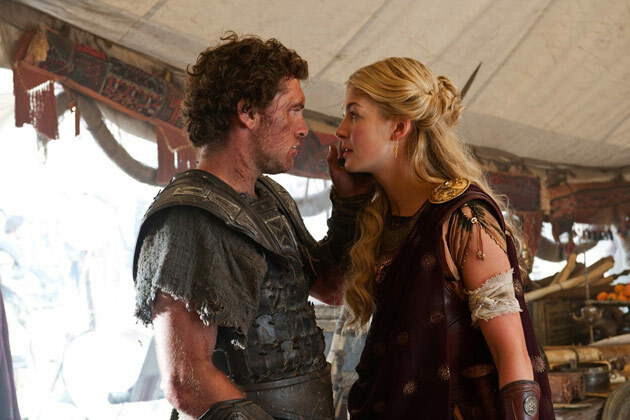 There is one character…and one character alone…that I really enjoyed in this film: Agenor, the son of Poseidon, who provided to comic relief in the film. Ok…two. Kronos was pretty cool. Not gonna lie! Almost all of the creatures/monsters were amazing. But, in a movie, the monsters/creatures that aren’t the main characters should NOT be the most memorable parts or people of a film. 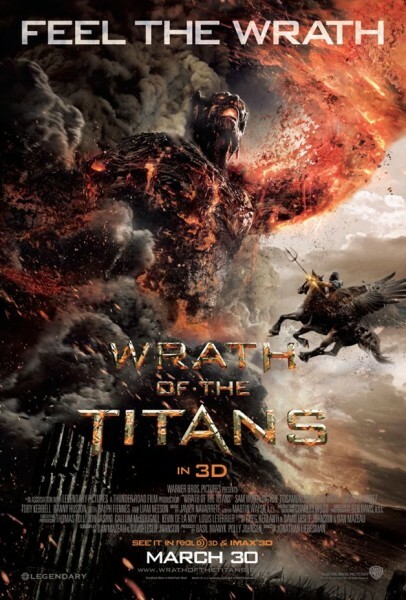 Action: full of monsters, sword fights, and fire, Wrath of the Titansmakes a futile attempt to cover a lame story with fantastic battles and lace it with underlying infusion of relationships and internal struggles. For being all about the “Titans”, very little happens with the Titans at all. It leads up to much, with great expectations, and the let down of sorts led me to want to pour out the Wrath of T! "My hair almost looks better than yours!" Ok, It’s not all that bad, but it did leave me wanting. Better than the remake, but not by much. Tons of fun action and adventure. Not much by way of story and character. Visually fun and exciting, but very little surprises. Will you be checking it out? 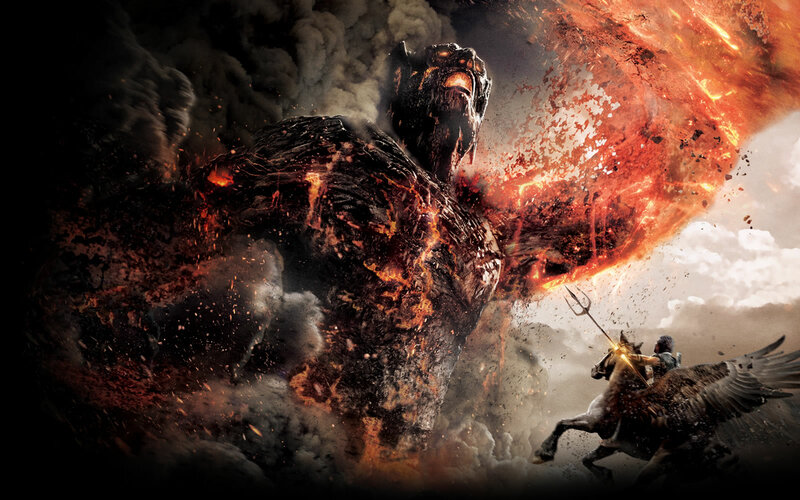 (oh, and I didn’t see it in 3D, so I can’t tell you if it is better than Clash of the Titans in that regard). I do plan on checking this one out this weekend. Primarily, it’s for the undertone blogger Darren wrote about in his fine exposition on Greek mythology and monothesism. Thanks, T.
Thanks for the comment. I will be sure to read it. At work at the moment. Still haven’t seen Clash and still not feeling a desperate need to. Think I’m going to skip this franchise altogether. You have got me a little intrigued by this one though. I’m hoping to check this out next week. I didn’t mind Clash, it was a silly film with a lot of silliness. In fact, I think I spent the whole time wondering how the guys didn’t manage to flash a little too much in the fight scenes when they were getting thrown around all over the place! Sometimes I need to see a little bit of fun trash in the cinema. These have looked visually interesting, but I haven’t seen either of them. And haven’t seen the original Clash since I was a kid. I’ll probably address all three at some point, but it’s probably going to be a while — especially if it’s not raking in the high review marks this time around either. Glad you saw this to warn us of the wrath of the Titans, ahahaha… I won’t touch this movie w/ a ten-foot pole given how terrible the first one was, and Sam’s afro… oh man! Good thing you skipped the 3D, I saw it in the regular theater too last time and it was still a waste of money. The first one WAS so terrible, wasn’t it? yeah, this one’s better…but not much more. I stand with you in your hope Castor. I hope that there is no 3rd installment. Not even sure what that would look like with the way this one kinda ended. I think I am confused with ur rating. 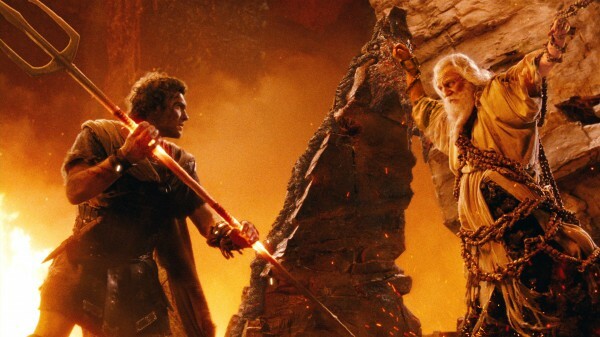 I hope ur not saying that u think John Carter was better than this? I was in the same baot u were in. I wasn’t all that impressed with the first one myself, and only went to see this film because I owed my followers a review. The story was lack-luster, but I expected that. This sequel stepped it up a knotch with its visual effects. This made the movie entertaining and fun to watch. I wasn’t expecting much, and it seems that I walked out of the theatre liking it a little more than u…lol.